MYSORE: Member of Legislative Council “Mukhyamathri” Chandru, who had launched “Kannada Nudi-Kannada Gadi” jatha to understand the problems of the people in border areas, has urged Chief Minister-designate B.S. Yeddyurappa to accord priority to Kannada and implement the recommendations made by various committees constituted to address grievances of people living in the border areas. Official language It was an opportunity for the BJP-led coalition Government to take steps to make Kannada as the official language in the State without making any compromise, he said. He called upon Mr. Yeddyurappa to appoint only those who knew to write and read Kannada as Ministers. He said that legislation should be made in Kannada and direct authorities, especially bureaucrats, told to make file notings in Kannada. Criticised Taking exception for the delay in commencing the work on the Vidhana Soudha at Belgaum, where the previous Government held a legislature session, Mr. Chandru said it was necessary for the new coalition Government to take up work on the project in a time-bound programme and hold another session of legislature to create confidence among the people. Pointing at the apathy of the previous government in implementing the recommendations of the Vatal Nagaraj and Baragur Ramachandrappa Committees, which were formed to improve the conditions of the people in the border areas, he said that it was imperative for the government to commence the work on “Gadi Bhavana” (office buildings in border areas). He said that he had sanctioned Rs. 5 lakh from his Legislators’ Development Fund for building Gadi Bhavanas in 20 places. “It is necessary for the Government to complete the work on these buildings by 2008 to prove its commitment to the people in border areas, he said. Mr. Chandru called upon the government to implement recommendations of Sarojini Mahisi Commission to help local people in getting employment, as it was mandatory for the industries to reserve 80 per cent of posts for the local people. JOIN you EKAVI DISTRICT and TALUQ. Please tell your friends and send it to them also. 4. Term of office and conditions of service. 5. Disqualification for office of membership. 8. Officers of the Authority and conditions of service. 10. Proceedings presumed to be good and valid. 12. Powers and duties of sub-committee. 13. Obtaining the services of experts. 14. Preparation of project and programmes. 15. Functions of the Authority. 16. Officers made responsible to carry out the objectives of the Authority. 18. Advise by the Authority..
19. Power to record dereliction of duty and to inform the appointing authority. 20. Fund of the Authority. 21. Allocation for project and programme. 22. Grant by State Government. 25. Budget of the Authority. 26. Power to make rules. 27. Power of Authority to make regulations. Act 28 of 1994.- It is considered necessary to provide statutory status to the Kannada Development Authority for the effective implementation of projects and programmes relating to development of Kannada and monitor and evaluate the implementation of Kannada as Official language. Amending Act 26 of 1997.- Consequent to the bifurcation of the Department of Law and Parliamentary Affairs into Department of Law and Department of Parliamentary Affairs and Legislation, it is proposed to have the Secretary of the Department of law as the member of the authority and the director of translations also as a member of the said authority and further to empower the authority to take action to secure priority for, and promotion of Kannada in the field of Education and Cultural activities. An Act to provide for establishment of a Kannada Development Authority for development of Kannada, and to supervise the implementation of projects and programmes relating to development of Kannada and to monitor and evaluate the implementation of Kannada official language and its projects and programmes. 1. Short title and commencement.- (1) This Act may be called the Kannada Development Authority Act, 1994. (2) It shall come into force on such 1[date]1 as the State Government may, by notification, appoint. 1. The Act has come into force by notification w.e.f. 1.11.1995. The Text of the notification is at the end of the Act. (g) “Regulation” means, regulations made under this Act. 3. Constitution of the Authority.- (1) As soon as may be, after the commencement of this Act there shall be established for the purposes of this Act, an Authority for development of Kannada to be called the Kannada Development Authority with its head-quarters at Bangalore. (2) The Authority shall be a body corporate by the name aforesaid having perpetual succession and a common seal to contract and shall by the said name sue and be sued. Chairman of the Authority. — Chairman. 1. Omitted by Act 26 of 97 w.e.f. 30.9.1997. 1. Inserted by Act 26 of 97 w.e.f. 30.9.1997. (g) The President, the Kannada Sahitya Parishad. — Ex-officio Member. (h) The President, the Karnataka Kannada Sahitya _ Ex-officio Academy. Member. 4. Term of office and conditions of service.- (1) Subject to the pleasure of the State Government, the Chairman and other members nominated by the State Government shall hold office for a period of three years. This shall not apply in case of official member. (2) The Chairman or a member other than an ex-officio member may resign his office by writing under his hand addressed to the State Government but shall continue in office until his resignation is accepted. (3) A causal vacancy in the office of a Chairman or a member shall be filled by the State Government by nominating another person as Chairman or member as the case may be and the person so nominated shall hold office for the unexpired portion of the term of the office of his predecessor. (4) The Chairman and other members shall receive such allowances as may be prescribed. (5) The allowances payable to the Chairman and other members shall be defrayed out of the Fund of the Authority. (6) No act or proceedings of the Authority shall be invalid by reason only of the existence of any vacancy or defect in the constitution of the Authority. (e) has directly or indirectly by himself or his partner any share or interest in any work done by the order of the Authority or in any contract or employment with or under or by or on behalf of the Authority. (2) A person shall not be disqualified under clause (e) of sub-section (1) or be deemed to have any share or interest in any contract or employment within the meaning of the said clause by reason only of his having a share or interest in any newspaper in which any advertisements relating to the affairs of the Authority is inserted. Provided that no member shall be removed under this clause unless he has been given an opportunity of making his representation against the proposal. 7. Secretary.- The State Government shall appoint an officer not below the rank of Deputy Commissioner to be the Secretary of the Authority. The Secretary shall receive such salary and other allowances as the State Government may determine from time to time. (2) The State Government may grant from time to time leave of absence to the Secretary. (e) be responsible for presentation of records of the office during inspection of Chairman. 8. Officers of the Authority and conditions of service.- (1) Subject to such rules as may be prescribed, the State Government or such other officer as the State Government may authorise, may appoint or depute such officers and employees as it may deem necessary for the efficient discharge of its functions. (2) The recruitment and terms and conditions of service of the officers and servants specified above shall be such as may be prescribed. 9. Meetings of the Authority.- (1) The meetings of the Authority shall be convened by the Chairman or by the Secretary with the prior approval of the Chairman and shall be held at any place within the jurisdiction of the Authority. (2) The Authority shall meet at least once in every two months. (3) The Chairman or the Secretary with the prior approval of the Chairman shall convene a special meeting if the Chairman feels it necessary. (4) The Authority shall observe such rules of procedure in regard to the transaction of business at its meeting as may be provided by regulations. (5) Every meeting shall be presided over by the Chairman and if for any reason, the Chairman is unable to attend any meeting any other member chosen by the members present at the meeting shall preside at the meeting. (6) Eight members shall form the quorum. 10. Proceedings presumed to be good and valid.- No disqualification of or defect in the appointment of any person acting as Chairman or member shall be deemed to vitiate any act or proceeding of the Authority if such act or proceeding is otherwise in accordance with the provisions of this Act. 11. Sub-Committee.-The Authority may for any specific purpose constitute a Sub-Committee consisting of such members not exceeding five members from amongst its members, the Chairman of the Authority shall also be the Chairman of the Sub-Committee. 12. Powers and duties of Sub-Committee.- (1) The Sub-Committee shall exercise such of the powers and perform such duties of the Authority which are delegated to it by the Authority. (2) The Sub-Committee shall meet at least once in a month. (3) The Sub-Committee shall take decisions on urgent matters to review the prompt implementation of the decision of the Authority and suggest on urgent matter for action by the State Government. (4) The Sub-Committee shall observe such rules of procedure in regard to the transaction of business at its meetings as may be provided by regulations. 13. Obtaining the services of experts.- (1) In order to carry out the purposes of the Act, the Authority if necessary, may obtain the services or assistance of the experts in such manner as it may deems fit. State Government for approval. The State Government may approve the project and programmes with or without modification. (j) examine the standards of Kannada text books and give instructions to rectify the mistakes, if any, in these books. divisional level and the Tahsildar at the Taluk level shall be responsible to carryout the objectives of the Authority. (2) The State Government may by notification specify officer responsible for implementation of the different projects and programmes of the Authority and different class of officers may be specified for different departments. 17. Obtaining information.- The Authority may for the purpose of this Act seek and obtain information relating to implementation of Dr. Sarojini Mahishi Report and the Kannada Development from any officer of the State Government and such officer shall be bound to furnish the information sought by the Authority. 18. Advise by the Authority.- The Authority, in order to carryout the purposes of this Act, shall advise the State Government regarding implementation of its projects and programmes. 19. Power to record dereliction of duty and to inform the appointing authority.- The Authority in order to carryout the purposes of the Act, shall record, any violation by the officers and officials of the State Government and local bodies of any order, issued by the Government from time to time or of any order, which is already in force as dereliction of duty and shall advise to the appointing authority for necessary action. 20. Fund of the Authority.- (1) There shall be a fund called the Authority Fund. (ii) all other sums received by or on behalf of the Authority from any source whatsoever. (3) Except as otherwise directed by the State Government all money credited to the Fund shall be invested in any Scheduled bank. (4) The administrative expenses to the Authority including the salaries, allowances and pensions payable to the Secretary and other officers and employees of the Authority shall be defrayed out of the Fund of the Authority. 21. Allocation for project and programme.- The State Government may keeping in view the project and programmes of the Authority, make financial allocations to the Authority in the annual Budget of the State. 22. Grant by State Government.- The State Government may every year make a grant to the Authority of a sum equivalent to the administrative expenses of the Authority. 23. Accounts and audit.- (1) Accounts of the income and expenditure of the Authority Fund shall be kept in accordance with such rules as may be prescribed. (2) The Authority shall prepare an annual statement of accounts in such form as may be prescribed. (3) The accounts of the Authority shall be audited annually by such auditor as the State Government may appoint. (4) The auditor shall for the purposes of the audit, have access to all the accounts and other records of the Authority. (5) The Authority shall pay from its fund such charges for the audit as may be prescribed. (6) As soon as may be after the receipt of the report of the auditor, the Authority shall send a copy of the annual statement of accounts, together with a copy of the report of the auditor to the State Government and shall cause to be published the annual statement of accounts in such manner as may be prescribed. (7) The State Government may after perusal of the report of the auditor give such directions as it thinks fit to the Authority and the Authority shall comply with such directions. 24. Report.- The Authority shall before such dates, in such form and at such interval as may be prescribed submit the prescribed report to the State Government. 25. Budget of the Authority.- The Authority shall prepare every year before such date and in such form as may be prescribed a budget estimate of its income and expenditure for the financial year to commence on the first day of April next following and shall forward it to the State Government. 26. Power to make rules.- (1) The State Government may, after previous publication by notification make rules to carryout the purposes of this Act. (2) Every rule made under this Act shall be laid as soon as may be after it is made before each House of the State Legislature while it is in session for a total period of thirty days, which may be comprised in one session or in two or more successive sessions and if, before the expiry of the session in which it is so laid or the session immediately following both Houses agree in making any modification in the rule or decide that any rule should not be made, the rule shall thereafter have effect only in such modified form or be of no effect, as the case may be, so, however, that any such modification or annulment shall be without prejudice to the validity of anything previously done under that rule. 27. Power of Authority to make regulations.- The Authority may subject to the provisions of this Act and the rules made under section 26 and with the previous sanction of the State Government, by notification, make regulations to carry-out the purposes of this Act. BANGALORE, JAN. 16. The Government has reportedly finalised the norms to include a representative of the Kannada Development Authority (KDA) in the appointment boards of public sector units to which the Sarojini Mahishi Report is applicable. The inclusion of a KDA representative in the appointment boards was said to be a major step to pave the way for implementation of the Sarojini Mahishi Report in toto, in phases. The Government’s decision was reportedly prompted by the joint efforts of the KDA and the Department of Industries. It was said that but for the “undaunted efforts” of the Industries Minister, Mr. R. V. Deshpande, and the KDA Chairman, Dr. Baragur Ramachandrappa, the Government would have remained unconvinced about the need to give the KDA a representation on the appointment boards. A meeting of the KDA and the Department of Industry was held on April 4, 2000, and Mr. Deshpande, Dr. Ramachandrappa and seven other bureaucrats participated. It discussed various orders issued by the Government and the problems being faced by it in implementing the Sarojini Mahishi Report in full. It realised the need to give the KDA a representation on the appointment boards, and urged the Directorate of Personnel and Administrative Reforms to take steps in this direction. Of the 58 recommendations made in the Sarojini Mahishi Report, employment of Kannadigas in the public sector units in the State had become a bone of contention and triggered unsavoury situations. The report had recommended that while filling Group D posts, Kannadigas should be preferred. It said that 80 per cent of Kannadigas should be appointed against the other posts in the basic salary of up to Rs. 1,250, and that 65 per cent of Kannadigas should be given top executive posts. But for various reasons, including the alleged regional bias on the part of a section of the authorities in some of the public sector units, and political reasons, the recommendations were not implemented in full. The Government’s exercise to accord priority to the Kannada language and Kannadigas in the State had, at times, become a political issue. It was said that the Government was pretending helplessness in implementing the recommendations made by its own committees. In an effort to give priority to Kannadigas in public sector units and commercial banks, the Government constituted a number of committees, including the Margaret Alva Committee (August 4, 1983) and Dr. Sarojini Mahishi Committee (January 25, 1984). Dr. Sarojini Mahishi Committee submitted its recommendations on December 30, 1986, and the Government constituted a Cabinet Sub- Committee on March 16, 1990, to look into the 58 recommendations. She said the the globalisation and economic reforms had made the recommendations of the Mahishi Committee more relevant today than ever before. “Main concern behind setting up the committee was to protect interests of Kannadigas and help them to progress economically in their own land,” she pointed out. Defending job reservation for Kannadigas, Dr Sarojini said that the Committee had recommended employment reservation only for eligible Kannadigas with working knowledge of Kannada. The Committee never asked for any relaxation in eligibility norms like qualification or competence while recruiting Kannadigas in private sector. Dr Mahishi, an outspoken politician, regretted that concern for language and culture was declining among Kannadigas. “If we (Kannadigas) do not protect our mother tongue, who else will?” she asked. Dr Sarojini Mahishi, a two-time MP from Dharwad North and former Union minister, is now residing in New Delhi. Q1. How many Kannadigas are currently employed in IT industries? Ans: As per the approximate estimates, the number of Kannadigas employed in the IT firms operating in Bangalore is less than 10 % of the total employees. This is way too less compared to Tamil population in the IT industry in Chennai and Telugu population in IT industry in Hyderabad (where they are 70-80% of total workforce). This disparity is because of the discrimination against Kannadigas during recruitment by IT companies in Bangalore. Q2. How are Qualified and skilled Kannadiga Candidates being discriminated in IT Sector? Ans: Even though Kannadiga candidates are well qualified and possess the required IT Skills and the relevant experience, they are not provided opportunities to prove their capability because of the discrimination against them. The only reason for this is that he / she is a Kannadiga and born in Karnataka. There are many instances of this type of discrimination against Kannadigas. Q3. How are Kannadiga Fresher candidates discriminated in Campus Recruitment? Ans. When an IT company decides for the recruitment of Fresh graduates, they conduct Campus Interviews in the Engineering Colleges across the country. These companies conduct Campus interviews in a few reputed colleges in Bangalore just to indicate that they are recruiting in Karnataka. But these very companies go to all the colleges of Tamilnadu, Andhra, Kerala & the North Indian States which are in the nook and corner of these states. Even though Karnataka has a very good number of reputed engineering colleges across the state these companies do not consider them for their Campus Recruitment process except for one or two colleges in Bangalore. Since Karnataka has a large intake of non-Kannadiga students for its engineering courses, a large number of students selected from these few colleges in Karnataka are again non Kannadigas. For example recently a reputed IT company recruited many non-kannadiga freshers in the pretext of selecting locals from Adichunchanagiri institute of Technology, Chikmagalur. Q4. How Kannadiga Employees are discriminated in the annual performance appraisals and are denied Promotions? Ans. During annual appraisal process Kannadiga employees are given step motherly treatment and their performance appraisals are not done fairly and objectively and thus are denied Promotions. Other non Kannadiga employees with similar performance are promoted to higher positions with good hike. Kannadigas are denied opportunities in working on challenging assignments, denied onsite opportunities and hence have less exposure in comparison to non Kannadigas who are provided with ample opportunities to perform and grow. Q5. Why Kannadigas are being discriminated in IT industry? Ans. The answer to this question is simple. The key positions (senior & middle management and HR) in these IT industries are in the hands of non-kannadigas who simply favour their own state candidates, against Kannadiga candidates. For example a Tamilian Project Manager prefers a Tamil person for an open position in his team and gets internal references from his fellow Tamilian team members and colleagues. If he doesnt get a suitable Tamilian candidate internally he decides for external reference by way of IT Consultants and shortlists only Tamilian candidates. He rejects Kannadiga Candidates referred by IT consultants even if he suits the job. The same is true for a Telugu Manager, Bengali Manager or a Keralite Manager or any North Indian Manager. The key positions in HR are also held by these non-kannadigas who show discriminatory attitude against Kannadigas. Thus kannadigas are getting unfair and unjust treatment in IT Industry. Q6. How Kannadigas are neglected in the non-technical sector of the IT industry? Ans. Catering, Security, Housekeeping, Transport, Internal retail stores and other service contracts are also given to non-kannadigas. Many IT companies have given catering contracts to people from Tamilnadu, Kerala and Andhra. Majority of the security personnel are from other states. Q6A. How else are Kannadigas suffering in the IT industry? Ans. There is tremendous Hindi imposition on the employees in the IT industry. Security, Transport and other vendor staff are instructed by the IT companies to only converse with the employees in Hindi irrespective of whether the Kannadiga employee understands Hindi or not. Speaking or responding to queries in Kannada is not an acceptable practice in these companies. Hindi songs / music through FM91 / cassettes are played as per the company policy on company transport and requesting for Kannada songs / music on company transport is not allowed. Cultural programs are allowed only in Hindi and any cultural program in Kannada and presenting Karnataka’s rich culture & heritage is not allowed. For example celebrating Kannada Rajyothsava is not allowed in many IT companies while non-kannadigas are allowed to celebrate Onam, Pongal and Holi without any restrictions. Q7. Why is the need for the implementation of Sarojini Mahishi report? Ans. By this time you are all aware about how and why eligible Kannadigas are being discriminated in the IT Industry and Kannada, Kannadiga and Karnataka are dishonored in their own state. So to stop this unfair and unjust treatment in recruiting Kannadigas in IT Sector, the need for the implementation of the Sarojini Mahishi report arises. Q8. What is this Sarojini Mahishi Report? Ans. In 1968, National Integration Council noted the dissatisfaction among population in various states due to discrimination being perpetrated by migrant population in employment of local sons of the soil. Hence National Integration Council recommended that the majority of the jobs shall be given to local people. Based on this Dr. Sarojini Mahishi committee was constituted in 1983, which studied this gigantic problem in detail for 3 years and made a total of 58 recommendations. It submitted its interim report on 13-6-1984 and final report on 30-12-1986. Some of the recommendations of the Sarojini Mahishi report, which are relevant to IT industry, are listed below for your understanding. Rec. 1. State government shall ensure that recommendations of national Integration council are implemented, through implementation of Dr. Sarojini Committee recommendations, as the recommendations of Dr Sarojini Mahishi committee are in concurrence with the recommendations of the National Integration Council. The state government shall also request Union government for help wherever required. Rec. 4. It shall be mandatory for all private industries to employ only Kannadigas for all positions. Exception can only be made in rare cases for top management positions, which require very high level of technical Qualifications and that too when Kannadiga candidates are not available. Karnataka government can exert pressure on private industries, as they are supplied land, water and electricity on priority basis from government. Rec. 21. Admission in technical and other training colleges in the state for outside state people shall be limited to max of 5%; this is essential to stop outsiders getting jobs because of this. Note: 21(a): G. O. CI. 121SPC. 82 dated 30 October 1982 has declared many incentives and concessions for attracting investments in industry. It shall be made mandatory for such industries to give employment to only Kannadigas to get concessions from government. Rec. 24. There shall be a state government representative in recruitment committees of private industries employing more than 100 people. Rec. 25. State government representatives in recruitment committees shall send report to state government about the working of such committees and an authority shall be established to examine these reports. Such authority shall be given statutory status. Rec. 28. Employers shall submit a declaration every year stating their compliance regarding providing stipulated numbers of employment to Kannadigas. Similar system is being practiced in Maharastra. Rec. 40. Persons trained in special skills required by industries in state can be supplied from Karnataka itself by arranging for such training in industrial training centers and engineering colleges. The committee has visited industries and compiled a list technical skills required by them. Government shall make suitable arrangement for implementation of this measure. 1. Applicant shall have 15 years residence in Karnataka. 2. Residence shall be proved through school certificate, ration card, voters list and birth certificate. 3. Serving military persons and persons staying outside state for reasons of studying or employment shall only given exemption from 15 years residence requirement. No one else shall need to be given this exemption. 4. Private residential layouts shall abide by BDA rules and shall obtain approval of BDA before allotment of sites. 5. Co-operative housing societies layouts shall abide by BDA rules and shall obtain approval of BDA before allotment of sites. Q9. Finally who is a Kannadiga? Ans: Govt. Order. -DPAR 37 SLC 84 dated 2-2-1985 has defined the term “KANNADIGA” as follows: “Kannadiga means a person who can read, write and talk in Kannada and has working knowledge of Kannada”. Q10. Does this clear your doubts on how Kannadigas are discriminated in their own land and the rightful demand for job preference to Kannadigas in IT sector? Please forward this to all Kannadigas so that the injustice meted out to Kannadigas in IT comes to the notice of all including the state government. Dr Sarojini Mahishi on Sunday called upon the government to implement the recommendations of Sarojini Mahishi report on giving preference to locals in employment. Speaking to mediapersons after the 32nd convocation of Karnataka Mahila Hindi Seva Samiti here, Dr Mahishi lamented that the government was yet to implement the recommendations that were submitted in 1984. “The implementation of the report has become absolutely necessary when Kannadigas are being sidelined in the State following the advent of Multinational companies. Even if a host of problems crop up during implementation, the government should go ahead with the recommendations and resolve the problems along the way,” she said. The issue of reservation of jobs for Kannadigas in the IT sector seems set to rock the IT.In conference being organised by the state government from October 26 to 28 with the Karnataka Rakshana Vedika (KRV) threatening to disrupt the international conference in case this demand is not met. Ironically, the issue of reservation for Kannadigas was raised by the state government during the recent attrition with the IT industry. State Industries Minister PGR Sindhia raised the issue after the IT industry announced that it would boycott the IT.In conference. The minister had claimed that the IT companies, while demanding infrastructure upgradation, should also provide employment to Kannadigas. The minister had gone on to announce that the government had issued 167 notices to various companies, including software companies, asking them why they were not providing reservations in jobs to Kannadigas by implementing the Sarojini Mahishi Committee report. A majority of the IT companies did not reply to the notices as implementation of the Sarojini Mahishi report is not binding on them. Even as the government has let off the pressure on this front after a truce with the IT companies who are now set to participate in the IT. In conference in strength, the issue is set to snowball into a major source of conflict in the state. The Karnataka Rakshana Vedika (KRV) launched an agitation on this issue last week by picketing the gate of IT major Infosys. KRV activists also broke some windowpanes near the main gate as a hapless police force tried to pacify them. The KRV state president A. Narayan Gowda said that the actvists would disrupt IT.In conference in case the recommendations of Sarojini Mahishi Committee recommendations were not implemented. The state government, which had rode on this issue to put pressure on the IT sector earlier, does not seem to display the same vigour in pressing the demand now. Secretary IT and BT Shankarlinge Gowda when questioned in this regard at a function held to unveil the programme of the IT. In conference last week said the concern of the government had already been conveyed to the IT sector. When pressed further, he said the government was viewing the incident as and individual law and order problem. He said the government would view the issue in the same manner in case any attempt was made to disrupt the IT conference. BANGALORE: Kannada activists received a shot in the arm on Monday with chief minister N Dharam Singh directing chief secretary B K Das and other IAS officers to accord primacy to Kannada in administration and implement the Sarojini Mahishi Committee report. Singh, while interacting with Kannada litterateurs, social activists and representatives of the Kannada film industry on chalking out plans for Suvarna Karnataka (golden jubilee of the formation of Karnataka) celebrations, told the officials to compulsorily use Kannada in all their communication. “The Sarojini Mahishi Committee report, which has recommended preference to Kannadigas in employment, will have to implemented without giving excuses,” Singh told the officials. On the year-long celebrations starting from November 1, 2006, Singh said the government has earmarked Rs 10 crore for it and, if required, would sanction more funds to make it a grand success. ಕನ್ನಡಿಗರಿಗೆ ಉದ್ಯೋಗ ಕ್ಷೇತ್ರದಲ್ಲಿ ದಶಕಗಳಿಂದ ಅನ್ಯಾಯವಾಗುತ್ತಿದೆ,ಇದನ್ನು ಕಂಡು ಕಾಣದ ಹಾಗೆ ಕನ್ನಡಿಗ ಇದ್ದ. ಅನ್ಯಾಯ ಮಾಡುತ್ತಿದ್ದ ಪರಭಾಷಿಕ ಹಿಂದಿನ ಬಾಗಿಲನ್ನು ಹಿಡಿದು ತನ್ನವರಿಗೆ ಕೆಲ್ಸ ಕೊಡಿಸುವ ಕಾರ್ಯ ಮುಂದುವರೆಸುತ್ತಲೆ ಬಂದ. ಹೋರಾಟ ನಡೆಸಿದ. ಅದರ ಫಲವೇ ಸರೋಜಿನಿ ಮಹಿಷಿ ವರದಿ. * ಇದನ್ನು ಯಾರು ನೇಮಿಸಿದರು ಮತ್ತು ಇದರ ಉದ್ದೇಶಗಳೇನು ? ಅವನಿಗೆ ಸಿಗಬೇಕಾದ ಹಕ್ಕುಗಳ ಬಗ್ಗೆ ಈ ಸಮಿತಿ ಶಿಫಾರಸು ಮಾಡಿತು. * ಈ ಸಮಿತಿ ಎನು ಮಾಡಿತು ? ಕನ್ನಡಿಗರ ವಿವರವನ್ನು ಪಡೆದು ಒಂದು ಶಿಫಾರಸು ಮಾಡಿ ಸರ್ಕಾರಕ್ಕೆ ಸಲ್ಲಿಸಿತು. * ಮುಖ್ಯ ಶಿಫಾರಸ್ಸು ಎನು ? ಮತ್ತು ಹೆಚ್ಚಿನ ಭಾಗ ಅವರಿಗೆ ದೊರಕಬೇಕು. -೨- ಕೇಂದ್ರ ಸರಕಾರೀ ವಲಯದ ಉದ್ಯಮದಲ್ಲಿ ಕನ್ನಡಿಗರಿಗೆ ಸಲ್ಲತಕ್ಕ ಉದ್ಯೋಗ ಪ್ರಮಾಣ ಹೀಗೆ ಇರಬೇಕು. ಅಂತ ಕೆಲ್ಸವನ್ನು ಬಿಟ್ಟು ಉಳಿದ ಎಲ್ಲಾ ಕೆಲಸಗಳಲ್ಲಿ ಕನ್ನಡಿಗರಿಗೆ ಆದ್ಯತೆ ಕೊಡಬೇಕು. ಸೌಲಭ್ಯಗಳನ್ನು ಪಡೆದಿರುವದರಿಂದ , ಅವರ ಮೇಲೆ ಒತ್ತಡ ಹಾಕಿ ಕನ್ನಡಿಗರನ್ನು ನೇಮಿಸುವಂತೆ ಕಡ್ಡಾಯ ಮಾಡಬೇಕು. -೫- ಉದ್ಯಮಗಳಲ್ಲಿ ಟೈಪಿಸ್ಟ ಮತ್ತು ಅಪ್ರಟಿಂಸ್ ಕೆಲ್ಸಗಳನ್ನು ಸರ್ಕಾರದ ಉದ್ಯೋಗ ವಿನಿಮಯ ಕೇಂದ್ರದಿಂದ ತೆಗೆದುಕೊಳ್ಳಬೇಕು. ವಾಸ ಮಾಡಿದ್ದಾರೆ ಎಂಬುದನ್ನು ಈ ಕೆಲ ದಾಖಲೆಗಳನ್ನು ಪರಿಶೀಲಿಸಬೇಕು. –೮- ಉದ್ಯಮಗಳಲ್ಲಿ ನೌಕರ ಮಕ್ಕಳಿಗೆ ಆದ್ಯತೆ ಕೋಡುವದನ್ನು ಮೊದಲು ನಿಲ್ಲಿಸಬೇಕು. –೧೦– ಲೋಕಸೇವ ಸ್ಪರ್ಧಾತ್ಮಕ ಪರೀಕ್ಷೆಯಲ್ಲಿ ಕನ್ನಡ ಪತ್ರಿಕೆಯನ್ನು ಕಡ್ಡಾಯ ಮಾಡಬೇಕು. ಕನ್ನಡ ಪತ್ರಿಕೆಯಲ್ಲಿ ಅನುತೀರ್ಣರಾದವರು ಅನರ್ಹರು ಎಂದು ನಿಯಮಗಳನ್ನು ತಿದ್ದುಪಡಿ ಮಾಡಬೇಕು. ಒಟ್ಟು ೫೮ ಶಿಫಾರಸ್ಸು ಇದ್ದವು, ಅವುಗಳಲ್ಲಿ ೫೪ ಸರ್ಕಾರವೇ ಮಾಡಬಹುದಿತ್ತು, ಆದರೂ ನಮ್ಮ ಘನ ಸರ್ಕಾರ ಇನ್ನೂ ಮಾಡಿಲ್ಲ. I was not so very fond of architectural heritage of India. That is until I got a good view of the temples of Belur and Halebeed recently, understood the complexity involved and visualized the minutest details to which the rocks were carved. The temples of Belur and Halebeed were built around 12th century by the rulers of the Hoysala Dynasty. The story goes that the dynasty was founded by a young man called Sala who killed a tiger with bare hands. The symbol of Hoysalas hence is a man killing a tiger. Halebeed was the capital of the dynasty where the temple stands. The temple of Halebeedu was constructed over a span of 190 years and remained incomplete. The Belur temple took more than 100 years to construct. The material used for both temples is soap stone which is soft and easy to carve when taken out from the earth but gets harder over prolonged exposure to the atmosphere. Halebeedu, when translated from Kannada means old habitat. This was named as Dwarasamudra in the times of Hoysala Dynasty and became an ‘old town’ after invasion from Muslim Rulers of the north. As with most of the historic temples, this temple also has seen some damages. The deity of the temple is Shiva in the name of Hoysaleshwara who is worshipped in the temple’s two shrines even now. The temple also hosts two of the largest Nandi statues in India. The guide told us they are the 7th and 8th largest Nandi statues in the country. The carvings seen around the temple are amazing. Every inch of the wall is filled with art and the attention to details in each carving are surprising. The image above shows the carvings on the circumference. The bottom layer are elephants which are more than thousand in number, with each one in a different position than other. No two elephants are unique. There are seven layers with the subsequent layers hosting lions and horses and more. There are stories of the Mahabharata and many mythological stories carved on the outer wall. The above image is of Bheema killing elephants in the war. To his right is an elephant he is tackling and to his left is a pile of elephants he has already killed! Such images are in plenty. Just after the temple is a big lake once called the Dwarasamudra. Archeological Survey of India have maintained the temple well and you get well informed guides who can show you around the temple. Make sure you hire a guide to make your visit worthwhile. The Belur temple is more known for the “Shilabalike” – the images of women carved in stone all around the temple. Each image is of a women doing different things or engaged in different occupations. They have interesting names such as ‘Shuka Bhashini’ for a lady talking to a parrot; ‘Darpana Sundari’ for a lady with a mirror and such. The guide said that people hid the temple from invaders by covering it up completely in sand because of which the temple is intact. The carvings in Belur temple are as intricate as its counterpart in Halebeedu. 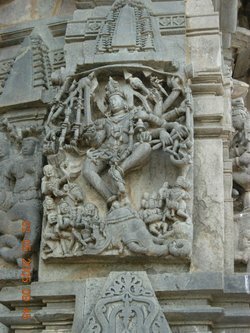 The temple hosts an idol of Vishnu in the name of Chennakeshava, which can be translated from Kannada as ‘the beautiful Vishnu’. The guide also informed us about another famous Hoysala temple with similar architecture at Somanathapura near Mysore, which I am yet to visit. The two places are around 20kms apart. If you are driving, drive from Bangalore to Hassan. Take NH4 out of Bangalore. After driving for around an hour, turn left to NH 48(Bangalore to Mangalore road) at Nelamangala. Continue driving on the highway till you reach Hassan town(around 180kms from Bangalore) which is a few kilometers to the right of the highway. Ask for directions to Halebeedu once you are in town. Halebeedu is around 40kms from Hassan town. The drive from Bangalore takes around 6 hours. If you are taking the bus, take KSRTC buses to Hassan from Bangalore where you can change buses to Halebeedu or Belur. Frequency of buses from Hassan to Belur should be good, but try to find bus timings to Halebeedu in advance. The best town head for staying overnight could be either Hassan or Chikkamagalur. But you can also find some basic accommodation in Belur. Mysore, Sept. 17, 2004 (KCU)- An e-mail signature campaign from Kannadigas all over the world has been launched by V.M. Kumaraswamy, founder of e-Kavi, a forum of Kannada lovers from all over the world, to urge the Government to implement the Sarojini Mahishi Report. Dr Sarojini Mahishi Report Recommending Jobs For Kannadiga Sons of the Soil. Minutes of EKAVI Mysore Meeting held on May 6th 2007 at Mysore. namma EKAVI Mysore sangha da modalaneya sabhe. ottu aaru mandhi seriddevu haagu bahalastu vishyagalannu samaalochisidevu. hosa parichaygalu aadavu. EKAVI Mysore ina uddeshagalu haagu adara bhavishyavannu kooda parichayisidevu. hechige alladiddaru, sumaaraagi ond ardha gantegala kaala, ellarigu EKAVI ya mundina kaaryakramagala bagge ellaru avaravara abipraayagalannu mundittaru. namma kannada bhaashege estu praamukhyate kodabeku naavugalu embudannu tamma tamma aasakthi inda mundittaru. mundina sabheyannu ee thingala 27 randu kooda nischayisi, indu aariruva (6) sanghada sankhye yannu arvathakke (60) eerisuva nirdhaara maadiruvevu. ellaru ee dikkinadege hejje iduvevu. 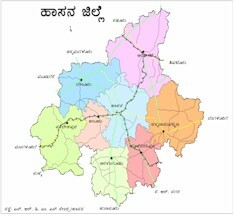 udayavaagali namma cheluva kannada naadu. ¢|| PÉ.¦. ¥ÀÇtðZÀAzÀævÉÃd¹é CªÀgÀ PÀ£À¸ÁzÀ PÀÄªÉA¥ÀÅ PÀ£ÀßqÀ vÀAvÁæA±ÀªÀ£ÀÄß C©üªÀÈ¢Þ ¥Àr¸ÀÄªÀÅzÉÃ ªÀiÁgÀÄw vÀAvÁæA±À C©üªÀÈ¢ÞUÁgÀgÀ ªÀÄÆ® GzÉÞÃ±ÀªÁVzÉ JAzÀÄ ªÀiÁgÀÄw vÀAvÁæA±À C©üªÀÈ¢ÞUÁgÀgÁzÀ ²æÃ J¸ï.r. D£ÀAzï ªÀÄvÀÄÛ ªÀÄAeÁZÁgï w½¹zÀgÀÄ. CªÀgÀÄ ¥ÀA¥À ¥Àæ±À¹Û ¥ÀÅgÀ¸ÀÌøvÀ vÉÃd¹é UÀtPÀ C©üAiÀÄÄPÀÛ (£ÉÆÃA) EªÀgÀ ¸ÀAAiÀÄPÁÛ±ÀæAiÀÄzÀ°è £ÀqÉzÀ E – PÀ« GzsÁÏl£É ªÀÄvÀÄÛ ¸ÁªÀiÁ£Àå¸À¨sÉAiÀÄ°è ¨sÁUÀªÀ»¹ ªÀiÁvÀ£Ár vÉÃd¹éAiÀÄªÀgÀ PÀ£À¸ÁzÀ UÀtPÀzÀ°è C£Àå¨sÁµÉUÀ½AzÀ PÀ£ÀßqÀ ¨sÁµÉUÉ °¥ÀåAvÀgÀ ªÀÄvÀÄÛ ¨sÁµÁAvÀgÀ, UÀtPÀzÀ°è zsÀé¤¬ÄAzÀ ªÀÄÄzÀæt, ªÀÄÄzÀæt¢AzÀ zsÀé¤ , D¦ÖPÀ¯ï PÁågÉPÀÖgï gÉPÀUÉßöÊeÉÃµÀ£ï, PÀ£ÀßqÀ ªÁåPÀgÀt, C®APÁgÀ ªÀÄvÀÄÛ ¸ÀªÀiÁ¸ÀUÀ¼À vÀAvÁæA±À, ¨ÉæöÊ¯ï °¦, ¨ÉæöÊ¯ï °¦¬ÄAzÀ PÀ£ÀßqÀ °¦UÉ PÀ£ÀßqÀ °¦¬ÄAzÀ ¨ÉæöÊ¯ï °¦UÉ °¥ÁåAvÀgÀ ¥ÀjªÀvÀðPÀUÀ¼ÀÄ, ¨ÉæöÊ¯ï °¦AiÀÄ°è zsÀé¤¬ÄAzÀ ªÀÄÄzÀæt, ªÀÄÄzÀæt¢AzÀ zsÀé¤ EªÀÅUÀ¼À vÀAvÁæA±ÀªÀ£ÀÄß C©üªÀÈ¢Þ ¥Àr¹ ¥ÀÇtð ZÀAzÀævÉÃd¹é CªÀgÀ PÀ£À¸À£ÀÄß £À£À¸À£ÁßV ªÀiÁqÀ®Ä ¥ÀæAiÀÄwß¸À¯ÁUÀÄªÀÅzÀÄ JAzÀgÀÄ. PÁAiÀÄðPÀæªÀÄªÀ£ÀÄß GzsÁÏ¹zÀ f¯Áè PÀ£ÀßqÀ ¸Á»vÀå ¥ÀjµÀvï CzsÀåPÀëgÁzÀ ²æÃAiÀÄÄvÀ. ºÉZï. ©. gÀªÉÄÃ±ï ªÀiÁvÀ£Ár «ªÉÃPÁ£ÀAzÀ, ¸ÀÄ¨sÁµï ZÀAzÀæ gÀAvÀºÀ vÁåUÀªÀÄ¬Ä AiÀÄÄªÀPÀgÀ CªÀ±ÀåPÀvÉ »A¢VAvÀ®Æ FUÀ ºÉZÁÑUÀ ¨ÉÃPÁVzÉ JAzÀÄ w½¹ PÀÄªÉA¥ÀÅgÀªÀgÀÄ ¤¸ÀUÀðªÀ£ÀÄß PÀÄjvÀÄ §gÉzÀgÉ vÉÃd¹é ¤¸ÀUÀðzÀ «¸ÀäAiÀÄªÀ£ÀÄß PÀÄjvÀÄ §gÉzÀgÀÄ JAzÀÄ w½¹zÀgÀÄ. E-PÀ« ¸ÀAWÀl£ÉAiÀÄ zsÉåÃAiÉÆÃzÉÝÃ±ÀUÀ¼À£ÀÄß PÀÄjvÀÄ ªÀiÁvÀ£ÀrzÀ ºÀAiÀiÁvï gÀªÀgÀÄ PÀ£ÀßrUÀgÀ MUÀÆÎr¸ÀÄ«PÉ, PÀ£ÀßqÀ G½«PÉUÁV EgÀÄªÀ vÉÆqÀPÀÄUÀ¼À ¤ªÁgÀuÉ, PÀ£ÀßrUÀjV®è ºÉÇÃgÁlzÀ ªÀÄ£ÉÆÃ¨sÁªÀ ªÀiÁr¸ÀÄªÀÅzÀÄ, ¸ÀAWÀzÀ GzÉÝÃ±À JAzÀgÀÄ. ºÁ¸À£À vÁ®ÆèPÀÄ PÀ£ÀßqÀ ¸Á»vÀå ¥ÀjµÀvï CzsÀåPÀëgÁzÀAvÀºÀ qÁ|| d£ÁzsÀð£ï ªÀiÁvÀ£Ár f¯Áè PÀ£ÀßqÀ ¸Á»vÀå ¥ÀjµÀvï ¨sÀªÀ£ÀzÀ ªÀÄÄAzÉ ¤«Äð¸À®Ä GzÉÝÃ²¸À¯ÁVgÀÄªÀ PÀ«PÀmÉÖ ºÁUÀÆ eÁÕ£À¦ÃoÀ ¥Àæ±À¹Û «eÉÃvÀ PÀ£ÀßqÀ PÀ«UÀ¼À ²®àgÀZÀ£ÉUÉ DyðPÀ £ÉgÀªÀ£ÀÄß ªÀAwPÉ gÀÆ¥ÀzÀ°è ¸ÀAUÀæ»¸À®Ä ¸ÀºÀPÀj¸ÀÄªÀÅzÁV w½¹zÀgÀÄ. PÁAiÀÄðPÀæªÀÄzÀ°è PÀ¯Á«zÀgÁzÀ zÉÃ¸Á¬Ä ªÀÄvÀÄÛ PÀ¯Á«zÀ, avÀæPÀ¯Á ²PÀëPÀ ºÁUÀÆ ²°à ¸ÀÄªÀÄAvï CPÀð¸Á° ºÁUÀÆ ªÀiÁgÀÄw vÀAvÁæA±À C©üªÀÈ¢ÞUÁgÀgÀ ¸ÀAWÀzÀ ¸ÀÄ¢üÃgï ºÉZï. J¸ï., J¸ï.r. D£ÀAzï ªÀÄvÀÄÛ ªÀÄAeÁZÁgï ªÀiÁvÀ£ÁrzÀgÀÄ. E-PÀ« CzsÀåPÀë ªÀÄªÀÄvÉÃ±ï CzsÀåPÀëvÉ ªÀ»¹zÀÝgÀÄ. ¸À¨sÉAiÀÄ°è ¥ÀA¥À ¥Àæ±À¹Û ¥ÀÅgÀ¸ÀÌøvÀ vÉÃd¹é C©üAiÀÄÄPÀÛ (£ÉÆÃA) ¸ÀAWÀzÀ UËgÀªÁ CzsÀåPÀëgÁzÀAvÀºÀ J¸ï.PÉ. zÁåªÉÃUËqÀ, CzsÀåPÀëgÁzÀAvÀºÀ J¸ï.r. gÀªÉÄÃ±ï ºÁdjzÀÝgÀÄ. ¸À¨sÉAiÀÄ°è ¸ÀÄªÀiÁgÀÄ 100 d£À ¨sÁUÀªÀ»¹zÀÝgÀÄ. PÀ« PÀmÉÖAiÀÄ£ÀÄß ¤ªÀiÁðt ªÀiÁqÀ®Ä CAzÁdÄ ¥ÀæPÁgÀ ¸ÀÄªÀiÁgÀÄ gÀÆ.2.50,000=00UÀ¼ÀÄ DUÀÄvÀÛzÉ. vÁªÀÅ zÀAiÀÄªÀiÁr F MlÄÖ ºÀtzÀ°è gÀÆ.2,00,000=00UÀ¼À£ÀÄß zsÀ£À ¸ÀºÁAiÀÄ gÀÆ¥ÀzÀ°è PÉÆqÀ¨ÉÃPÁV vÀªÀÄä°è £ÁªÀÅUÀ¼ÀÄ «£ÀAw¹PÉÆ¼ÀÄîvÉÛÃªÉ. £ÁªÀÅ E- PÀ«AiÀÄ£ÀÄß ¸ÀAWÀl£É ªÀiÁqÀ®Ä ºÉZÀÄÑ CªÀPÁ±À PÀ°à¹zÀAvÁUÀÄvÀÛzÉ. C®èzÉÃ PÀ£ÀßqÀ ¥ÀgÀ MAzÀÄ M¼ÉîAiÀÄ PÉ®¸ÀªÀ£ÀÄß gÁeÁåzsÀåAvÀ ºÁ¸À£ÀªÀ£ÀÄß ªÀiÁzÀjAiÀiÁV vÉÆÃj¸À§ºÀÅzÀÄ. £ÁªÀÅ F jÃw ªÀiÁqÀÄªÀÅzÀjAzÀ £ÀªÀÄä E-PÀ«AiÀÄ §®ªÀ£ÀÄß ºÉaÑ¹PÉÆ¼Àî§ºÀÅzÀÄ ªÀÄvÀÄÛ QjAiÀÄ ¸Á»wUÀ¼ÀÄ, ¯ÉÃRPÀgÀÄ, PÀvÉ ªÀÄvÀÄÛ PÀªÀ£ÀUÁgÀjUÉ EzÀÄ ¸ÀÆàwðAiÀÄ MAzÀÄ C¥ÀgÀÆ¥ÀzÀ ªÀiÁzÀj PÀmÉÖAiÀiÁVgÀÄvÀÛzÉ. DzÀÄzÀjAzÀ vÁªÀÅUÀ¼ÀÄ zÀAiÀÄªÀiÁr F ªÉÄÃ¯É PÁtÂ¹zÀ ºÀtªÀ£ÀÄß ªÀAwPÉ gÀÆ¥ÀzÀ°è PÉÆlÄÖ PÀ£ÀßqÀPÉÌ, PÀ£ÀßqÀ¥ÀgÀ PÉ®¸À ªÀiÁqÀÄªÀªÀjUÉ ªÀÄvÀÄÛ E-PÀ«AiÀÄ §®ªÀzsÀð£ÉUÉ C£ÀÄPÀÆ® PÀ°à¹PÉÆqÀ¨ÉÃPÁV vÀªÀÄä°è «£ÀAw¹PÉÆ¼ÀÄîvÉÛÃ£É.